Medium (8-10) - $42.99 Only 9 left! Large (12-14) - $48.99 Only 4 left! What do you want to be when you grow up? What superpower would you most want? There aren’t many responses that can answer both questions with such flawless accuracy such as flight. Even when we break out of our childhood, we’re still staring up to the wild blue and imagining what it would be like to soar. Many of us are excited just to buy a ticket and travel long distances, climbing higher into the air with an airplane and whooshing to our new destinations, fighting with other passengers to try to get a window seat. But, even then, it isn’t us flying. Barely being driven, really! 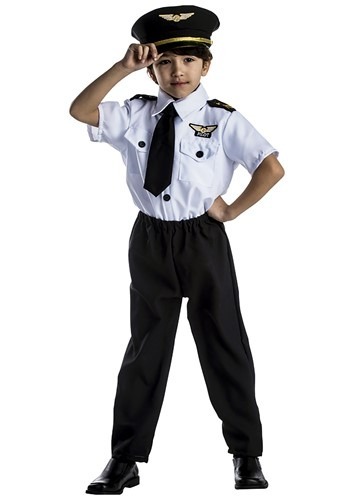 Give your kiddos the experience that you know they’re itching with the Kid’s Pilot costume. Easy fitting polyester fabric makes up a Velcro fastened shirt with the iconic wings printed over functional breast pockets. A sewn-in necktie ensures that your kid will stay in perfect style (and uniform) without having to worry about losing such a professional accessory! Matching pants are elastic, of course, but the hat is what makes the uniform complete; a plastic tubed frame keeps its shape and the matching embroidered wing patch marks your kiddo as the captain of the skies. Take off with your pilot this season and live out some of those same dreams.